Martorell, 05/02/2019. – A 53-year-old individual who is a fan of SUVs and takes two months to conclude their purchase. According to a study by SEAT’s Market Research department, this is the typical new customer profile in Europe’s automotive sector. Although in the case of SEAT, the average age of its customers drops to 44. But what leads people to buy a car? What features do we consider a priority? Below we take a close look at the process that many buyers follow before making their final decision. - Why buy a new car? : it is the second largest investment people make after the purchase of a house. 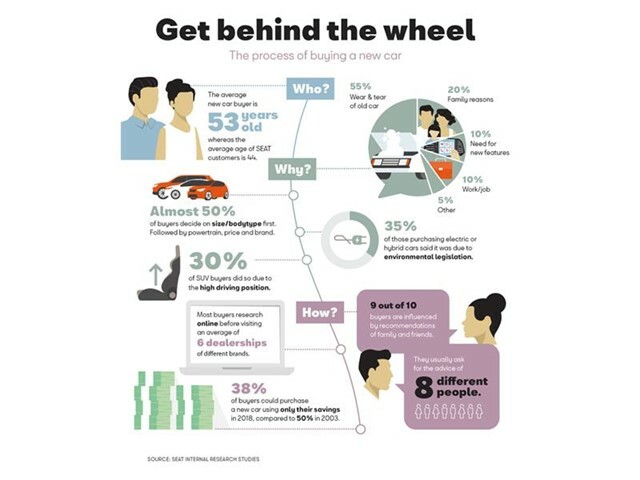 For 55% of buyers, their cars’ mileage and age are the reasons for buying a new car. 20% of sales are the result of wanting more safety, more space, lower fuel consumption or a car that is equipped with the latest technology. A further 15% say they are motivated by family circumstances, either because of marriage or separation, or welcoming an addition to the family. Other contributing personal factors for 10% include changing jobs or completion of studies. - Eight and a half weeks: is how long the purchasing process usually takes. 45% of people first decide what body style and size they want. 24% of customers begin with what kind of engine they want (diesel, petrol or hybrid); while 17% have a strict budget in mind and the remaining 14% want a specific brand. In this sense, SEAT Market Research and Product Strategy head Enrique Pastor says that 55% of future buyers who begin with a brand in mind change their preference throughout the process. - Internet yes, but with a personal touch: 9 out of 10 buyers admit that recommendations made by people in their closest circle have an impact on their final decision. They usually seek advice from an average of 8 friends or family members. Despite the rise of digital tool such as the carmaker’s website configurator (56% of customers use one), the dealership is still a key figure. 55% of buyers value courtesy, a better price and financing options more than proximity – half of all customers do not buy their car from the dealer closest to their home. - The first time: a person buying their first car is one of the moments they remember for life. Hesitation usually combines with anticipation, and perhaps because of this people seek more guidance and advice. Before closing their purchase, these customers visit up to 10 dealerships of different brands, four times more than non first-time buyers, and speak with an average of 15 friends and family members for recommendations. 40% of people who buy a car for the first time link their purchase with work purposes. - Monthly instalments or cash? : brands currently finance half of the cars they sell through their own finance companies, a percentage which has doubled since 2003, when Banks where the primary lenders. Only 38% of buyers can afford to purchase a car with their savings, 12 points fewer than 15 years ago. - Driving without restrictions: 35% of those who choose a hybrid drive or electric vehicle admit they are motivated by driving restrictions during periods of heavy pollution. This new environmental legislation is already being applied in major European cities such as Barcelona, Madrid or Paris. - An SUV with outstanding design: design is fundamental to 41% of future buyers, a percentage which only stood at 29% just 15 years ago. At the same time, 30% look for cars with a high driving position, a figure that links to the rise in SUVs such as the SEAT Ateca, the Arona or the new Tarraco. In fact, SUVs now account for 33% of all cars on European roads.